Caponata is a Sicilian aubergine dish, a cooked vegetable salad made from chopped fried eggplant and celery seasoned with sweetened vinegar, and capers in a sweet and sour sauce. 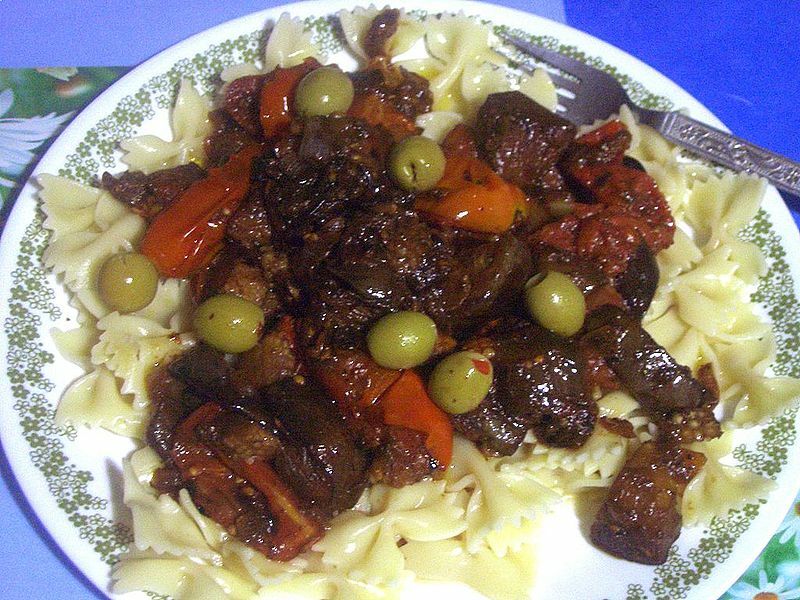 Left: Caponata seasoned with dried oregano, garlic, onion, olive oil and aceto balsamo di Modena. Numerous local variations of the ingredients exist with some versions adding olives, carrots and green bell peppers, and others adding potatoes, or pine nuts and raisins. There is even a Palermo version that adds octopus, while an aristocratic Sicilian recipe includes lobster and swordfish garnished with wild asparagus, grated dried tuna roe and shrimp. However, these last examples are exceptions to the general rule of a sweet and sour cooked vegetable stew or salad. Caponata is an example of the aubergine-tomato combination that is found in many Mediterranean cuisines, such as Provençal ratatouia or the different moussaka found in the eastern Mediterranean. Don't cut the aubergines too small as they will soak up too much oil and become heavy. Get yourself a large pan, pour in a couple of glugs of olive oil, and place on the heat. Add your aubergine chunks and oregano, season with a little salt and toss around so the aubergine is evenly coated by the oil. Cook on a high heat for around 4 to 5 minutes, giving the pan a shake every now and then. When the aubergines are nice and golden on each side, add the onion, garlic and parsley stalks and continue cooking for another couple of minutes. Feel free to add a little more oil to the pan if you feel it's getting too dry. Throw in the drained capers and the olives and drizzle over the herb vinegar. When all the vinegar has evaporated, add the tomatoes and simmer for around 15 minutes or until tender. Taste before serving and season if you need to with salt, pepper and a little more vinegar. Drizzle with some good olive oil and serve sprinkled with the chopped parsley leaves and the almonds if you like. Serve as a warm vegetable side dish or a cold antipasto on lightly toasted bread that had been rubbed with a cut garlic.